A new pattern for the Star Wars collection is here. 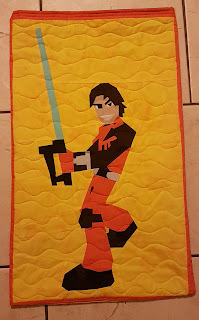 This pattern was inspired by my little nephew who loves Star Wars Rebels, the cartoon. He especially loves Ezra Bridger. Ezra Bridger grew up as a street urchin on the planet Lothal, and soon discovered that he was force sensitive. He joined a rebel crew on the Ghost and started his apprecticeship to become a Jedi at a young age. The size of the pattern is perfect for the front of a pillowcase, as shown in the photo above. I did not include instructions for the pillowcase. You can find many different tutorials out there for pillowcases. My favorite is from Jennifer Ofenstein at Sewhooked, it is called "Hotdog! A pillowcase." There is a pdf and a video tutorial. Go check it out. You have the cutest patterns!